Japanese netsuke are superb little carvings, mostly made out of ivory or wood, as handling pieces, or toggles. So one good way of judging a good netsuke is to handle it, whilst doing so it should feel very comfortable and interesting, in the hand, without any disturbing sharp points. Although netsuke are often only about an inch high, these tiny sculptures are very powerfully carved and so full of character. Each netsuke will always have a couple of linked holes, or a deliberate gap often between a tail or leg, for a cord to be attached so that they could be used as a toggle. They were then most often attached to an inro. Yet there are many collectors that only collect netsuke without owning any inro. So what is an inro? 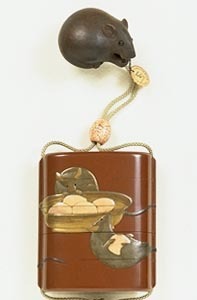 These are finely decorated lacquer containers, consisting of a number of interlocking compartments, usually there are between 2 to 6 compartments, all held together on a cord. 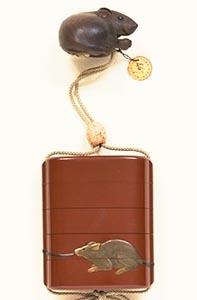 An ojime, this is a decorative bead, was then threaded onto the cord so that once pushed down towards the inro, it kept all the compartments closed. Ojime can be exquisitely carved metal, ivory or stone beads. These inro were then used for carrying such small personal items as seals and pills and became fashionable with the Kimono. The kimono had no pockets so the inro, held closed by the ojime, would be worn hanging from the sash; the netsuke was then, pushed up under the sash, thus trapping and holding the inro in place. The Japanese lacquer work on inro is so beautiful, yet it is such a difficult medium to work with, as well as being a time consuming process. Not only does it involve building up a very large number of layers before any decorative work can be introduced, but there are also then several different very fine skills required in completing the decoration. Techniques involve using coloured lacquer, shell inlay, metal work and amazing applications of tiny bits of gold. What is extraordinary too, is that having completed the decoration, the lacquer and any metal, or shell decoration, often can be quite thick, yet all the inro sections fit into each other so smoothly that when the inro is closed, all one can see, are very fine lines that are really the dividing gaps between the various compartments. This photograph* shows a fine wood netsuke of a mouse eating a bean, the pod beneath him. Japan, late 19th century. Signed: Tomokazu, Gifu. Provenance: Tomkinson Collection. The ojime is lacquered with crushed eggshell. This inro is a good and rare four case tan inro. The tan ground is decorated with three rats stealing eggs. One pulls the tail of another, which lies on its back holding an egg; the third is peering into the bowl of eggs. All in shades of gold, silver, and natural coloured takamakie with nashiji interior. Signed: Zeshin (Shibata was his family name) probably an early work. The designs used by the lacquer artists were not only very finely executed but were often deliberately worked around both sides of the inro in such a way as to maximise curiosity, thus forcing one to want to turn the inro over, to see what is on the other side. What does seem a pity these days is that there are collectors that only collect netsuke, or inro, some even only collect the ojime! No doubt this has a great deal to do with the escalating cost of these treasures, but really these particular Japanese antiques all belong together. It is so much more satisfying to find the ideal netsuke and ojime that relate well together with a favourite inro. To own only an inro and ojime, these are often sold together, but without the netsuke, the inro and ojime still seems so incomplete.